Resetting startup type for a plethora of networking related services in 1803 offers some hope of relief, according to MS Answers. 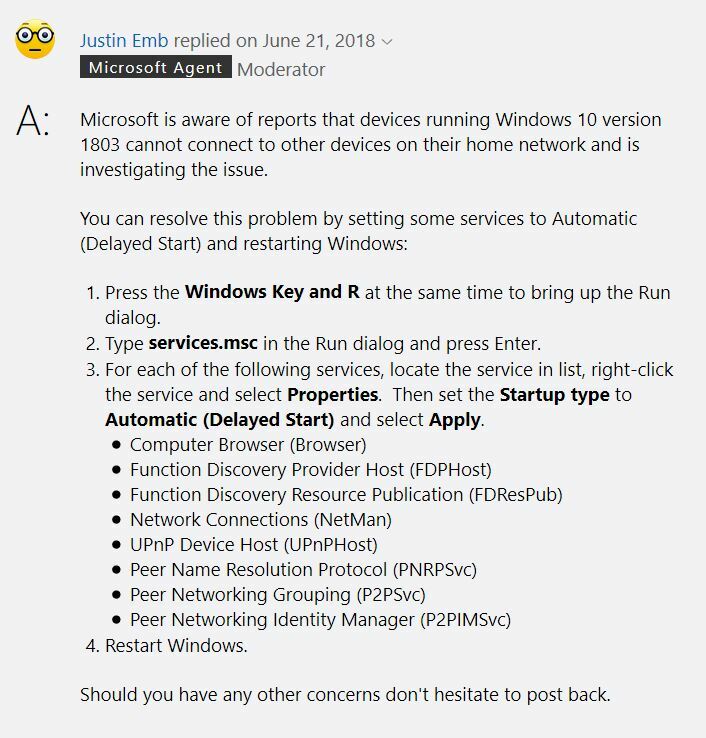 While the MS Answers response labels this as a “home networking” issue, it actually applies to all Win10 networks where a formal network infrastrucutre is absent. By that I mean no local or cloud-based domain controllers, no local DNS, no Windows Server based file and print services. That describes a lot of small business networks as well as home networks, so it’s a bigger population than one might think. Personally, I didn’t have any trouble connecting over the LAN from one node to another after upgrading the 1803. My issue was node visibility. That means seeing all “live” Win10 nodes on the network at any given moment. For me, the only service changes necessary were those for the Function Discovery items in the MS Answers Q&A item. Those who do experience network issues with 1803 might want to try resetting startup type for both Function Discovery items. If that doesn’t fix things, make sure the local network is set to “Private” status. Ditto for network discovery and file and printer sharing in the Network and Sharing Center. Some users also report that turning on Public folder sharing under All Networks makes networks visible. If all else fails, try the whole gamut listed above. One more thing: I was able to confirm by experiment that a restart is necessary for machines whose settings are changed make them visible to the network. If you make some or all of the aforementioned changes but nodes still remain invisible on the LAN in File Explorer, try a restart. That may do the trick! "The Delayed auto-start flag could not be set." "Error 87: The parameter is incorrect." Happens on every computer I tried. Automatic works. Any suggestions? Try setting to Automatic instead, then. Never saw that error messae before: will do some research and post a follow-up if I see anything useful or potentially helpful. Sorry for the trouble.